Elder Robbins, as well as other General Authorities such as Elder McConkie, have said the ten virgins represent all members of the church. Elder Robbins makes a comparison that those without oil are like those who do not have a temple recommend, and are therefore not permitted into the bridegroom’s home (the temple). Those with oil are those members with temple recommends, and can and do enter the bridegroom’s home (the temple). So, if you take what Elder Robbins says as a starting point, it is possible that all ten virgins are endowed members, but those foolish five either do not have a temple recommend or do not attend the temple. What is clear is that it matters not if one is endowed, if they do not keep a current temple recommend, are temple worthy, and attend the temple, they will not be ready when the bridegroom comes and will not enter in with him. They are no better off than not having been endowed. Only those who keep oil in their lamps, worthily keep a current temple recommend and attend, will be ready. In the Church, I think many believe that once we are endowed in the temple all is said and done, we’ve reached the goal, and gained a certain irrevocable exalted status. But the power that comes from the temple comes in keeping a current temple recommend, staying temple worthy, and attending the temple. Being endowed once doesn’t bring that power. We need to keep our passport current. Once expired, it does us no good. 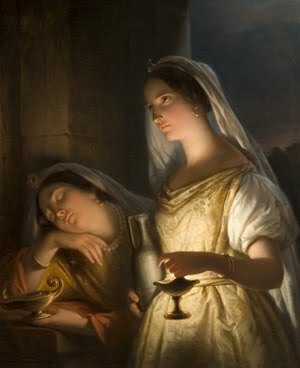 The five foolish virgins without oil had oil in their lamps at one point (it was “going out” as the Greek says), but once it was gone, having had it before didn’t help them when the bridegroom arrived. Let us have oil in our lamps when the Savior comes again. Bryce, just keeping the “passport” current does nothing to bring forth the power that is in the endowment and the ordinances of the Temple. I would have it go much further. You mention that members think once they complete their work the initial time they are ‘done’. And then you go onto state that a current recommend and attendance will keep the lamp full. It has been my experience that one must pro-actively, intensely, continually seek for much deeper light and knowledge of the gospel and of one’s discipleship in order to keep the lamp full. Not only must that include emulation of the Saviour (developing His attributes) but it must also involve adoration of the Him and God the Father. We must develop our ability to truly worship and praise. We must understand the depth of the Redemption, the wideness of the chasm between God and us, the grace and mercy of the Christ in his Sacrifice. Just following a checkbox of items or following the cultural recommendations of the Prophet are insufficient to put oil into the lamps. True conversion and discipleship require great intellectual and spiritual sacrifice. Talking in the Celestial Room about the kids or the ward members will not do it. Thank you for your comments Michael. I agree. That’s why I also said that one must stay worthy of a temple recommend too. A testimony of the gospel and our faith in Jesus Christ are an active experience. As we focus on becoming the sons and daughters of God, the actions naturally follow. The feet follow the heart. Though sometimes walking the walk will bring the change of heart necessary. That quote was from What Manner of Men and Women Ought Ye to Be? As with all parables (and the reason for their genius) there are multiple levels of application. This parable could also apply simply to being or not being baptized since baptism is the gateway into the Kingdom of Heaven (while the Endowment is the gateway in exaltation). Those who procrastinate the opportunity of being baptized will also be locked out from the Father’s kingdom. Have you made any kind of covenant with the Lord, either in the temple or on your own? Are you keeping to that covenant as strictly as you are able, according to your circumstances? And finally, If Christ came tomorrow, would you feel prepared? The lamp is not full when we cannot answer yes to those questions. With the first, if we have not been baptized will will have it done for us by proxy and have the ability to choose it in the next life. With the second, God will be standing across from us at the judgement day, and we will know our lack. With the third, we all feel underprepared, but knowing we have a current temple recommend and constantly striving to be worthy of that honor, is a basic step in being able to say “Yes, i’ll kneel at his feet and will smile at his presence.” Right now most of us feel more like we’ll fall to our knees and sob, but the fact that we’ll be in the right place when he comes again (the temple, his house here on earth), should be enough to keep us moving in the right direction. I think most of us can determine what was meant by this sentence : “What is clear is that it matters not if one is endowed, if they do not keep a current temple recommend, are temple worthy, and attend the temple, they will not be ready when the bridegroom comes and will not enter in with him. ” However, it needs to be correctly stated. One cannot attend the temple without a current temple recommend. There also comes a time in all our lives as we arrive at toward the end of this mortality that we may not physically be able to attend the temple, in which case I doubt seriously that the oil in our lamps would be diminished for our inability to go to the temple. Thank you for all you do for so many in helping us better understand the purpose for God’s Temples here in earth. Actually, that’s not really what I meant. If one receives their endowment, and never again (or rarely) attends the temple or carries a current temple recommend, I don’t think it will be well with them, for they have essentially broken the covenant. Receiving the endowment is an essential step for our exaltation, but what matters more is that we keep a current temple recommend, stay temple worthy, keep our temple covenants, and attend the temple if we can. That is what keeps the oil in our lamps. Let us not forget, the Temple is a vehicle not a destination. I once had a very wise Institute Instructor — who also happened to be my Stake President — make a comment in a class on Revelations that “If we kept ourselves worthy of a Temple Recommend, we would ‘make it’! All of us in the class felt — through personal revelation at that moment — that what this righteous priesthood holder and instructor had said was true — enough so that several of us noted the statement and the date in our scriptures. A month or so later, this Instructor/Stake President made the same comment in our Stake Conference and — again I and another friend — who also heard the previous comment in our Institute Class — felt that same understanding from the Holy Ghost that our Stake President had made a true statement. Again, I noted the repeat of this statement and its date into my scriptures. As a result of those two experiences, I truly feel that keeping oneself worthy — in every sense of the word — to hold a Temple recommend — regardless of whether or not we might be able to continue to attend the Temple at the end of our mortal existence due to physical or mental frailty or even great distance — will qualify us for exaltation in the Celestial Kingdom. I also agree that it is important to strive in every possible way — while attending the Temple — to come to a greater understanding of the mysteries of the Temple — however, I think that the most important consideration for the Lord will be our obedience and our consecration. Certainly having and keeping a temple recommend is important. But we need to look to the scriptures, the Book of Mormon in particular, for answers to questions about how to gain eternal life. When we do, the answers are certain. The first and most important thing we can do is to fulfill our our baptism covenant by receiving the gift of the Holy Ghost. There is no greater blessing we can obtain to. We come unto Christ through the Holy Ghost. Don’t forget, the deciding factor in the parable of who was admitted to the wedding feast centered on whether or not they had the Holy Ghost. I know of people who lie to obtain a temple recommend. They don’t believe in the church but don’t want to admit it so they deceive their Bishop. You must be the Jared from LDS Alive in Christ. I agree with you whole heartedly. It is the fire in the Holy Ghost that brings life. Having a temple recommend and attending the temple regularly when possible is the _do_. As Lynn G. Robbings taught in GC, “To be and to do are inseparable. As interdependent doctrines they reinforce and promote each other.” To teach and emphasize _be_ is more effective than a checklist gospel. It is funny, that I did not remember quoting that talk in my earlier comment. I think this talk impressed me most. I believe being temple worthy and having a current temple recommend are certainly part of “be.” Attending the temple, as often and when we can, will also transform us into the people we should “be.” Doing leads to being. We cannot be without do. This parable has always called my attention for not talking in terms of worthy/good and unworthy/bad but wise and foolish. As virgins, they are pure. From this perspective I would be very careful to try to link it to worthiness, the principle that a temple recommend is supposed to express. I see your point. Everytime one goes through the temple there is *chance* that new levels of meaning will be found and the commitement to the principles of the endowment will be renewed. Of course attending the temple doesn’t mean such experience will happen by itself. I would respectfully say that I feel some exagerated emphasis on attendance in the church. Taking temple attendance to the limits of absurd one should say that the covenants made in the temple are not valid unless the person keeps on attending the temple. Thinking about the changes in the way ordinances have been seen in our Church history it seems that the idea of renewing the baptismal covenant in sacrament has been applied to temple attendance as if it were a process to make the covenants valid. As if the expiration date of the temple recommend referred to the covenants made. That kind of reasoning would explain why e.g. nowadays people are not allowed to buy garments without a current temple recommend. I don’t think you are too far from the truth, Antonio. The sacrament is a precursor to the ordinances of the temple. Indeed, prophets have taught that in the sacrament we witness that we are “willing” to take upon us the name of Christ, and in the temple we actually do take upon us His name. So why would we need to partake of the sacrament on a weekly basis, and not attend the temple regularly? I don’t think it is absurd to think that for one to keep their covenants made in the temple that they should keep temple worthy, keep a current temple recommend, and attend regularly if able. Prophets have taught that we should attend the temple regularly. I think there is a reason for that, namely so that we can keep our covenants. If we don’t, we risk breaking our covenants, and losing the promised blessings. Thanks for your reply, Bryce. I agree that regular attendance is important, helpful to keep the covenants alive. I just don’t agrre that lack of attendance is similar to breaking those same covenants. Just as I can’t consider a person who doesn’t go to Sunday meetings less LDS than me. Interesting that there are many accounts showing how prayer circles used to be held at stake centers and at home where people were taught to have their own altars. So what we now take as “attending the temple” was understood then as practicing the temple teachings – including the ordinances – in one’s everyday life, at one’s own home, even for those living near a temple. I would like to understand better your take on the sacrament being a ” precursor to the ordinances of the temple”. It comes to mind however that sacrament used to be partaken in the early days of the Nauvoo temple what points out – imo – to the idea of a communion being established among those partaking and between them and the Godhead. This is a point where some historical research could be done but I have the impression that the sacrament as a renewal of baptismal covenants is a quite recent perception in our history. Let’s remember that rebaptism was once an important practice among Mormons. And for some purposes it was also practiced in the temple too. Well I guess I am suggesting here topics that are beyond the theme of the original post. Maybe the blog authors can take them as suggestions for upcoming articles. WE are only endowed once, so technically it CAN bring that power if we “keep our passport current.” Many people in the world have only one temple experience, so I think you may have spoken just a little incorrectly. But I understand the premise made in this article and thank you for this blog. It’s ok that we are only endowed once, and many members can only attend the the temple once in their lifetimes. The main point is that we keep temple worthy and have a current temple recommend. I also think that The parable of the Prodigal Son also deals with Endowed Members. Or at least Endowed Members that end up falling away and coming back. We know that members of the church that end up falling away end up losing the blessings of the Temple. But once they return or come back to those blessings can be restored. Their is something significant in that verse that the Father ends up dressing the lost son and restores him to his former status. The interesting thing with Parables is that we can intrepet them in so many different ways. But I like the idea of looking at some of the Parables of Jesus in connection with the Temple as the backdrop. @Rebekah in verse 22 it refers to royalty , and which this does refers to things of spiritual nature, I agree it involves the temple. Note also that the brother was also a sinner as it states in verse 28 “he was angry”, then you read you it all again then you find a much deeper meaning, he was focus on the worldly things (his inheritance). Now this inheritance was not the (receive all of our heavenly father hath) inheritance. Which I didn’t think of the second son too much until just a moment ago. I love the part where the father ran, which in Christ day that was badly looked upon for an old man to gird up his loins and run, so Christ was emphasizing the love of God, Christ wanted to them to really notice that. I love this website, and what others have to say. The parable of the Ten Virgins can be interpreted on many levels. However, not only are the virigins endowed members of the Church of Jesus Christ in all dispensations, they are they who have recieved their second annointing and ordiation. The implication to this is staggering. Nephi in the first two books of the Book of Mormon tries to get all to understand the necessity to be sanctified and not just forgiven of sins. I think the symbolism of the wedding garment is the key to this question. The idea doesn’t originate with me, but I’m happy to pass it on. Those who feel they can reasonably expect to enter into the wedding feast must wear the appropriate garment (according to Christ’s parable-Matt 22?). So, who in the church wears garments? Those who are endowed. As far as keeping a temple recommend is concerned, I think that much more is required than simply holding a current one. The temple isn’t the end. After baptism, it is the very beginning, and those things we do there are only symbolic (admittedly so). There is only saving power in the endowment insofar as we see the rites and ordinances as a process to participate in. That is why we are instructed to consider ourselves as Adam and Eve. There are many who wear the temple garment, but I fear few who have walked the path that is described in the endowment. By the way, I believe that thought originated with Denver Snuffer, but don’t quote me on that. Is the Virtue that comes from regular Temple attendance the gift we give to the Bridegroom? See History of Ancient Rome and discover the Vestile Virgins and their importance to the protection of Rome. The problem with Morman scholars, is they focus only one one version of the Bible, and forget Egypt Christology is apart of the spirituality, ancient Roman and Gaul dieties also had an influence in forming Catholicism, as did the other regionally tribes from Syria, Fonicia (Lebanon), Israel, Judea, Samaria, and Jordan were the Tribe of Rueben. A Granddaughter of King David, Julius Ceasar, and kin of Jesus Christ researches as well. so is endowed and receiving your endowment the same? I’ve been a Christian for 23 years. This is a strange language. Striving to “get in” was not why Jesus died on the cross. Didn’t he say right before giving up his spirit, ” it is finished”.? He did and completed everything for us. All we have to do is Believe and Trust in him, the rest will follow. The World wants us to believe we have to work and worry weather we are right with God. Jesus freely gave us His Righteousness, open your hands by an act of faith, and receive it. Ephesians 2 says…. I mean that you have been saved by grace through believing. You did not save yourselves; it was a gift from God. 9 It was not the result of your own efforts, so you cannot brag about it.